Sustainable Communities, Intentional Communities and Transition Towns offer us a chance to study the empowerment of people to create human spaces that are more sympathetic to nature, the environment and ecology. At the same time they deal with declining fossil fuels, depleted natural resources and the impact of climate change. An emphasis on incorporating clean renewable energy into all communities during this time of societal shift toward resilience and sustainability is absolutely necessary.
" 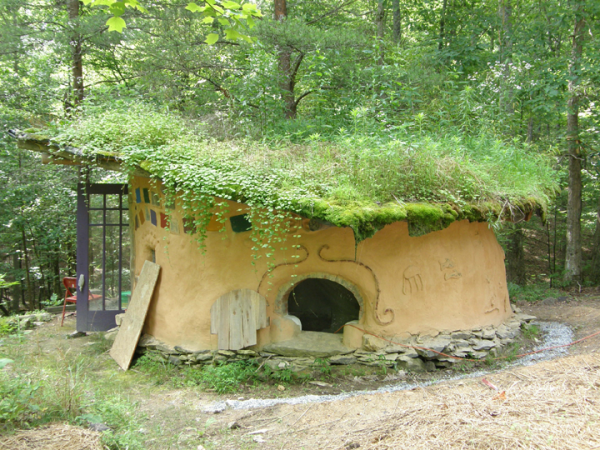 in Tennessee, and the Ecovillage Findhorn form human places where man integrates into his environment in a more sustainable way. They are good examples, but now we need a more inclusive model to follow for civilization as a whole. 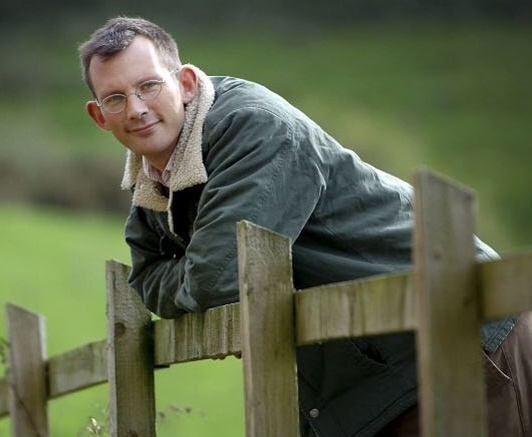 I believe that model to be the Transition Movement, which was started in England by Rob Hopkins. Sustainable Communities are communities planned, built, or modified to promote sustainable living conditions. They tend to focus on total sustainability, which would include development, economic concerns, resource management, energy resource stability, and local food production and distribution, just to name a few. Many communities around the North America are working on sustainability plans. 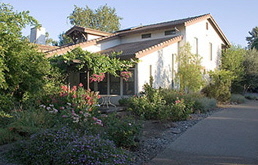 One of the first such places that was created in the 1970s was Village Homes in Davis, California. However there are other American cities like Portland, Oregon and Stapleton, Colorado that embrace these ideals. Even the state of Minnesota has put a plan in place for action. Acknowledges that economic, environmental and social issues are interrelated and that these issues should be addressed "holistically." Recognizes the sensitive interface between the natural and built environments. Understands and begins to shift away from polluting and wasteful practices. Considers the full environmental, economic and social impacts/costs of development and community operations. Understands its natural, cultural, historical and human assets and resources and acts to protect and enhance them. Fosters multi-stakeholder collaboration and citizen participation. Promotes resource conservation and pollution prevention. Focuses on improving community health and quality of life. Acts to create value-added products and services in the local economy. I would also stress the absolute need for energy autonomy to the above list as being one of the most important that we deal with today! However, their list of goals and objectives is a good starting point for any village, town or city. One of the very best examples of sustainable communities that I have seen was Village Homes', a seventy-acre subdivision located in the west part of Davis, California. It was designed to encourage both the development of a sense of community and the conservation of energy and natural resources. space! I visited Davis in 1976 and loved the sensibility of its development and design. While most streets in America were laid out north/south, Village Homes' streets were purposely laid out on an east/west axis to take full advantage of the sun. Similar modern communities have been planned and started with slight twists on this theme over time like Stapleton, Colorado as just one example. Village Homes gives us a good model of what future towns could look like, even though the development is now 35 years old. This area within Davis was designed and planned by developers Michael and Judy Corbett, with help from multiple architects and many others. Eventually this community included 220 single-family homes and 30 apartments. It is still a thriving and sustainable community today. Its developers in the book Designing Sustainable Communities: Learning from Village Homes, write about the planned design and its implication for future sustainable living concepts. The timeframe of the 70s also gave us the development of alternative lifestyles with the hippie movement. This period was an experimental time for social, cultural and moral shift. What developed out of it were places that have become known as Intentional Communities  some started back then and some of these places started in more recent times, but "
was a catalyst. Descriptive terms for ecovillages, cohousing communities, residential land trusts, communes, student co-ops, urban housing cooperatives, intentional living, alternative communities, cooperative living, and other projects where people strive together with a common vision are often lumped together in this category according to the Fellowship for Intentional Community website. Often times these spaces form because of common social, cultural and religious reasons. There are many communities throughout the world that could be described separately in this paper, but each description could be a complete article in itself. They do, however, offer suggestions for creative solutions toward future community development as we descend the mountain from the age of cheap oil. An attempt will be made to describe two of them..."
" and Ecovillage Findhorn...because each offers a different approach to forming these kinds of communities. in Mother Earth News and other magazines. I was fascinated by its story. The catalyst for the community started with San Francisco hippies in 1971. Wikipedia offers this description of the community..."
in books and on the Internet. of Findhorn which was founded in Scotland in 1985. 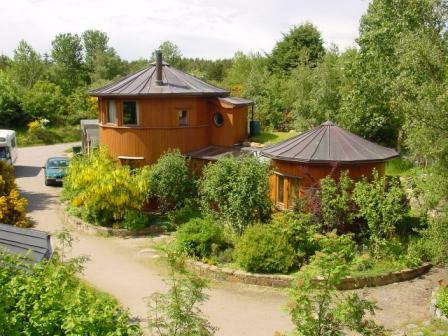 Their website gives this description..."
The Findhorn Ecovillage, situated in the beautiful Findhorn Bay of Moray, is a synthesis of the very best of current thinking on sustainable human settlements. Within the ecovillage, sustainable values are expressed in the built environment with ecological houses, innovative use of building materials such as local stone and straw bales, beauty in the architecture and gardens, and applied technology in the Living Machine sewage treatment facility and electricity-generating wind turbines. Sustainable values are also expressed in the community's social, economic and educational initiatives. Ecovillage Findhorn may be one of our very best examples of direct planning of intentional villages, but what about the rest of mankind? How can we take the examples demonstrated in this unique and wonderful place and expand them on a global scale? , society will be forced into a change that was as profound as going from the agricultural revolution to the industrial revolution. Expanding populations, due to the ability of man to produce more food on this earth because of the machines that fossil fuels drive, will find itself in contraction. How do we deal with the descent down from the peak of oil production, especially with the most populated places on earth  China and India  expanding their economies at the same time? Consider 7 billion people to feed and house and the demand that will be placed on all natural resources on this earth. These problems will expand exponentially as these economies and populations continue to grow. that we can pull out of the hat that will help us out of this situation, especially without any tangible help from our government. As just one example, in America we still can't even get a meaningful energy bill passed through Congress. 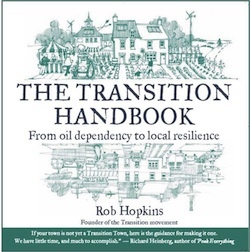 Studying many concepts on sustainability, I believe the plans laid down by Rob Hopkins in his book titled The Transition Handbook: From Oil Dependency to Local Resilience are without a doubt the best to embrace and lead mankind to a sustainable future. His thoughtful writing takes us from dire predictions about the future to a place of hope. In his handbook, Rob incorporates ideas that take town planning to a whole new level. It doesn't matter if you live in a small village, a medium sized town, or a large city - these concepts for meaningful survival apply everywhere. The Transition Movement distinguishes itself from these other communities by pooling resources not just for social, cultural, or spiritual reasons but also as a means of sharing dwindling resources during a time of declining fossil fuels and climate change. That life with dramatically lower energy consumption is inevitable, and that it's better to plan for it than to be taken by surprise. In his book, Hopkins emphasizes that peak oil and climate change are a bigger threat together than either one considered alone. Our biggest hope is to similarly converge our understanding of them, and learn how to deal with the dual problems they present. Peak oil alone should push these solutions to the forefront but to consider it without including climate change would be total failure in our quest to provide for a more meaningful and sustainable future for civilization. Fundamental to the Transition Town movement is the notion of resilience. It is defined in The Transition Handbook on page 54: "the capacity of a system to absorb disturbance and reorganize while undergoing change, so as to still retain essentially the same function, structure, identity, and feedbacks." In other words, resilience does not mean putting a fence around one's community, refusing to allow anything in or out. It means "being more prepared for a leaner future, more self-reliant, and prioritizing the local over the imported." (p. 55). Also on page 55, Hopkins describes three requirements for a resilient system as: Diversity, Modularity, and Tightness of Feedbacks. Diversity simply refers to the number of elements in the system - people, species, businesses, institutions, sources of food, etc. What matters is not so much the number of any of these entities but the connections between them and the diversity of responses to the number of challenges we face. The concept describes, in essence, a meaningful and mutually supported web of life. Modularity of a structure refers to the parts of the system that can re-organize in the event of a shock. It is a key concept in designing an energy-descent plan because the more modularity, the less vulnerability to disruptions in wider networks. As the Transition Handbook states on page 56: "Local food systems, local investment models, and so on, all add to this modularity, meaning that we engage with the wider world but from an ethic of networking and information sharing rather than of mutual dependence." Re-localization should be stressed instead of long distance mutual interdependence. Tightness of feedbacks analyzes how quickly and strongly feedback loops in the system can respond to changes in another part. Globalization and national systems can weaken feedbacks, whereas in localized systems, the results of our actions are more obvious and allow the community to bring the consequences of its actions closer to home. For example, if we live in the Midwest, we do not need to get our salad from California when lettuce is in growing season in Michigan! In summary, it is possible that a future with less oil could force a more positive approach to life on this planet than the current one where we are addicted to fossil fuels. This can only be accomplished, says the Transition Handbook, "...if we engage in designing this transition with sufficient creativity and imagination". That is what this handbook by Rob Hopkins really exemplifies. Even though the Transition Initiative started in England, it is now spreading throughout the world as people who care about their communities try to create more sustainable living environments. It is my hope that you will be inspired after reading this article to read the book. Implementing the concepts discussed in the handbook will give you the necessary tools you will need to become more proactive in your own community toward establishing positive change.